It has been nearly a week since my family have gone anywhere – because we have all been sick as dogs. Today, we are feeling like we are on the upswing collectively, and decided to run a few errands. While we were out, I decided to try and catch some Yasiel Puig fever, like I did with Strasburg a few years back. 1 blaster box of 2013 Bowman for $21.50 @ Walmart. First of all, kudos to Bowman for making clean cards now! Sorry, but 2011 and before were just plain ugly. These look slick. As chants of Yasiel Puig ran through my head (and some slipped out audibly as well) while I was opening them up in the car, WHAMMO …. Yay!!! 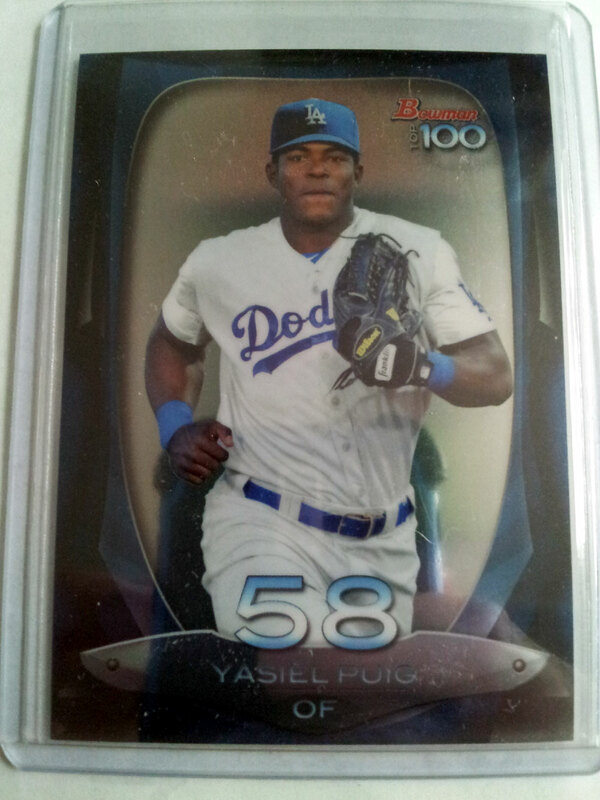 I remembered hearing a mini refractor of his had gone for $50-$70, so I thought this may be $10-20. Nope … A mere handful of hours after opening it up, I sold it for $45 shipped! Why, oh why, do people buy these singles when they are at the peak of their popularity? I would be willing to bet that within 30 days, this card will not even be selling for half of that.